The players (ages 4-10) drew their campsite & what they made. 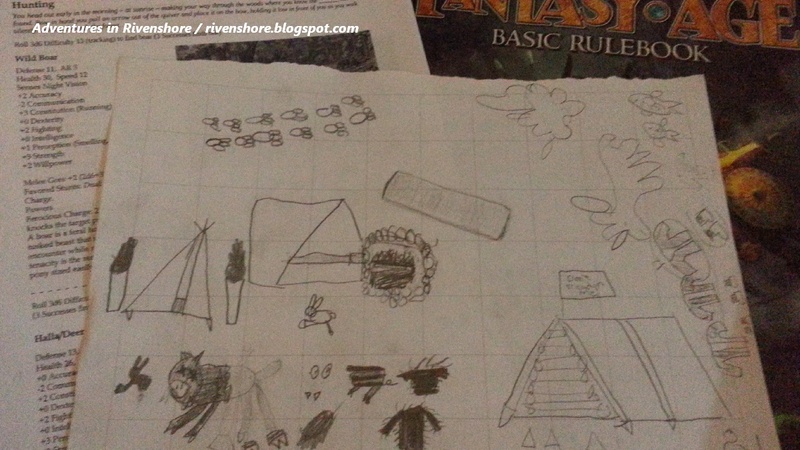 The party of three; Alexander (warrior), Green (rogue) and James (mage) headed into the forest to the north. They were heading to the foothills where they would find boar, deer and rabbits, plus a stream that was a hot spot for fishing, even more so then the river on the other side of the village. 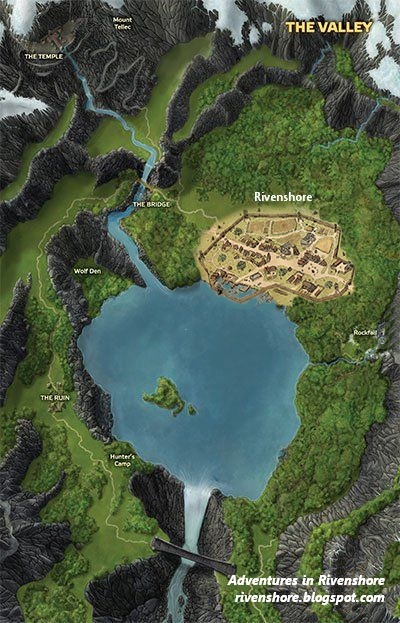 They were lead by Faerenal Derendil who was the head of the rogue department of the Academy. Once they made it to the clearing where the cadets would spend the next 32 or so hours, she reminded them that they were being tested, and then she left. The first thing they tended to was putting up their individual tents. Then went in search of wood for the fire pit that James had dug. Alexander built up the wood and Green worked on starting the fire. Once they had a good fire going Green headed out to hunt for Boar while Alexander set a bear trap just outside the camp. The cadets knew they would be selling the meat they did not eat from any game that they caught, plus the pelts if in good shape. Alexander and Green had decided they would make themselves coats from what they killed. Green took his time and after about an hour found several boar. He took aim with his bow and fired at the largest one. The arrow struck but didn't drop the boar, instead the boar charged at him and Green had to act fast. His second shot got the boar in the shoulder and dropped him. Then Green was able to finish the job and he dragged the boar back to camp. Alexander wanted a bear. Being a warrior it was natural that he wanted to test himself against the largest beast in the forest. However, he settled on deer. It took him a while but he found one grazing in a clearing and was able to sneak up on it and make a quick job of it. He wound up with two deer by the afternoon. James went fishing. He enjoyed the tacktile aspect of fishing. Holding the rod and hooking the bait, then waiting for a catch... and waiting... and waiting... finally something was on the line and he pulled and pulled, seeing it was a large trout, he worked with all his might when suddenly - snap! The line broke. He decided if he was gonna eat dinner he better go look for some rabbits. He caught one fairly quickly and was able to go back to camp and have rabbit stew. Meanwhile Green ate a wonderful meal of boar meat that he had slowly roasted skewered over the fire. While the meat was cooking he began work on the pelt. His goal was to make two coats from it. Quickly realizing he may need another boar to complete both, Green went on the hunt again. This time finding a smaller boar, but enough to complete his coats. 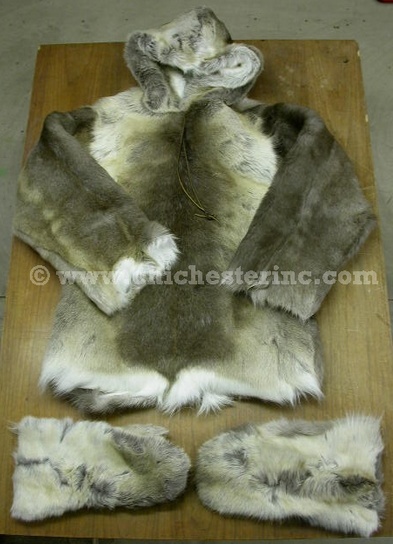 Alexander decided to also make coats from the deer he had caught. His first one though was a bit damaged, but he found it fine for himself. He'd need to make a better one to sell though. 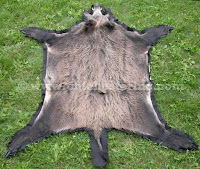 With the undamaged pelt he was able to make a fine one that he would sell when they went to the market square. Alexander headed back out before dark to do some fishing and after loosing a 30 inch carp, he wound up with a large cod. Not a bad day fishing. Then it was time to bed down for the night. All the meat that was not eaten (and there was a lot) was prepared and hung so it would survive the night. The cadets would finish their work on the pelts the next day, then break camp and head back to the village. Will the cadets pass their survival training? Will they get full price from Mrs. Padmore in the academy kitchen for the meat? 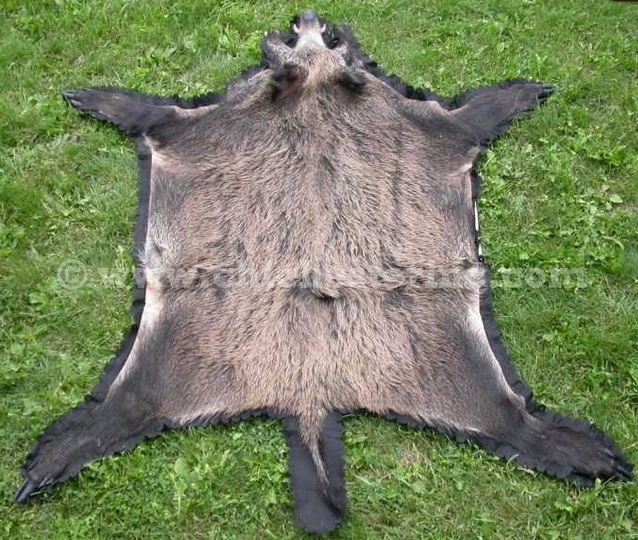 And what about those pelts they plan to sell at the market? What about those bears that Alexander wanted to catch? Are any close enough to smell the delicious meat hanging right in the middle of camp, ready for the taking? We'll find out next time!